Well, I didn’t really intend to go off the radar for a week, but unfortunately I had a horrible relapse with my pinched nerve issue in my shoulder/back/right arm last Friday, and I’ve spent almost the entire week sitting in one spot with my arm propped up, binge watching shows on Netflix in an effort to keep my mind off of the pain. But after two more trips to the chiropractor, several massages, lots of rest, and finally getting two good nights of sleep after four consecutive days and nights without a wink of sleep because of the pain, I seem to be on the mend again. I’ve never in my life dealt with any kind of chronic pain until now, and I’m telling you, I have a new respect/sympathy/empathy/compassion for people who deal with chronic pain regularly, and especially those who deal with it and yet somehow manage to go about their lives, go to their jobs, take care of their families, etc. The strangest thing is that before I dealt with this the first time a couple of months ago, I was listening to an interview with Bas Rutten, an MMA, UFC champion whose career was derailed by a nerve issue in his arm and neck. I listened to that interview thinking how strange it was that a nerve issue could take someone like that out of the game completely. I just couldn’t wrap my head around how a pinched nerve could be so bad. And then two or three days later, I had my first bout with my own pinched nerve issue in my neck, back, and arm. And now I get it. Now I totally understand just how debilitating it can be. So I’ve been down for the count. But while I’ve been binge watching Netflix to numb my mind, there has still been some progress at the house, and I want to show you the thing I’m the most excited about as of this morning. I mean, I’m only five feet tall, and even I felt like the ceiling was almost right on top of my head. 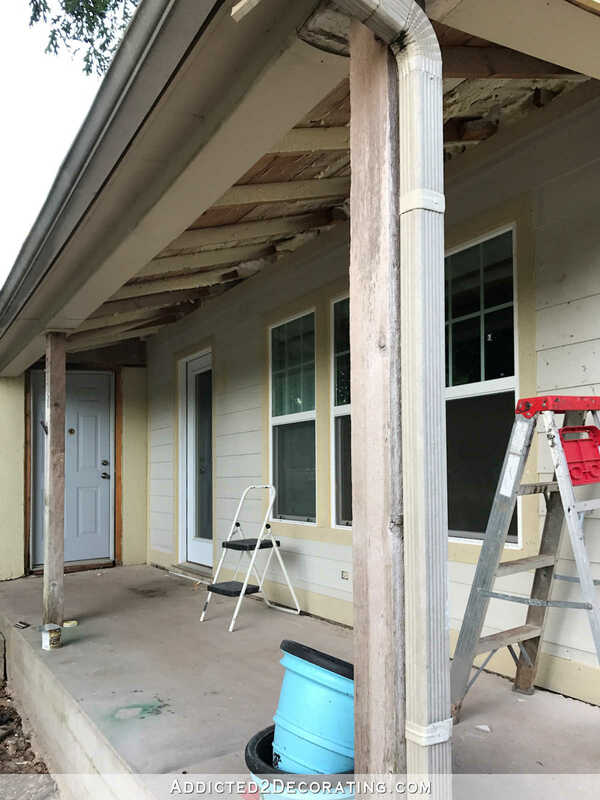 So before they put the new siding on the front porch, I had them remove the horizontal framing (i.e., the ceiling joists) on the front porch ceiling to make it an angled ceiling instead of a flat ceiling. Pictures don’t do it justice. 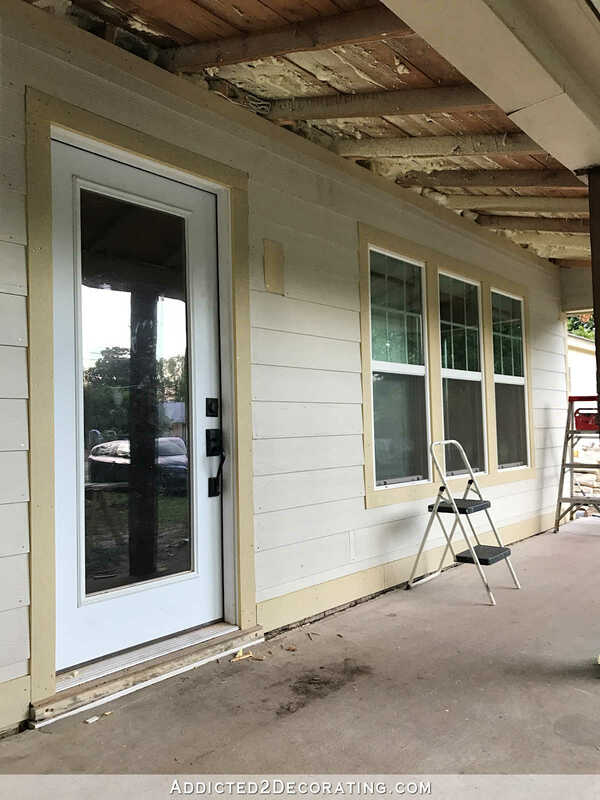 It still looks like a mess (and they’re here right now working on the end wall, closing up that second doorway and finishing the siding), but it’s more about how it feels while you’re standing on the front porch. 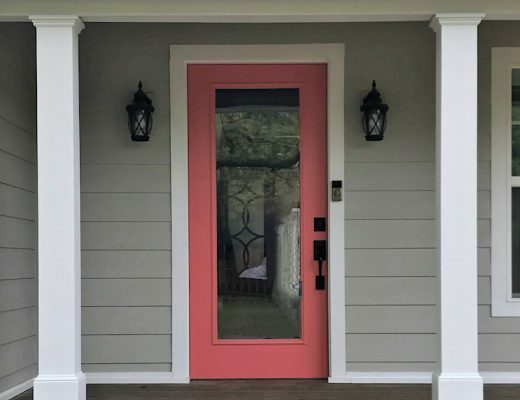 I’ve been dreaming of ways to finish out the front porch, and I’ve got lots of plans that include covering the concrete porch with stained wood, adding one more column and wrapping them to beef them up a bit and give them a traditional look, etc. I’ll wait for cooler weather (and until I can reach forward to pick something up without my entire arm immediately going weak, numb, and tingly) to tackle those things. But for the first time since we bought this house, I’m actually excited about putting time and effort (and money!) into some exterior projects. 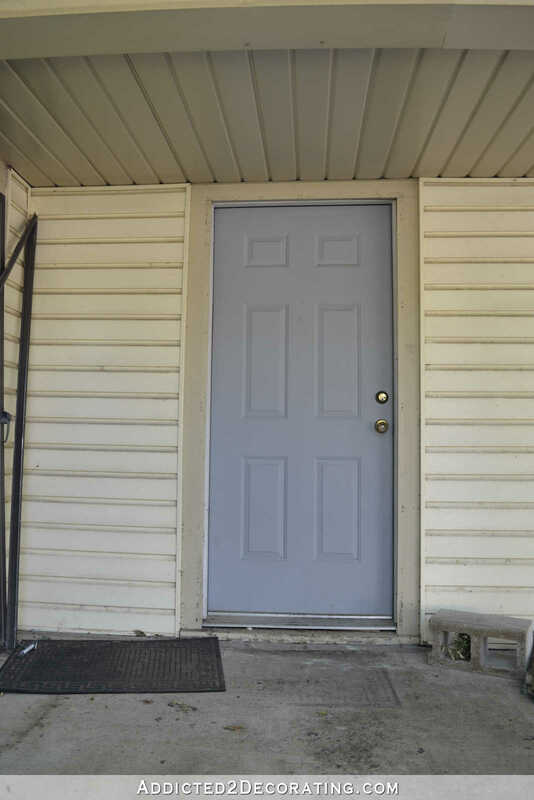 The new siding has not only done wonders for the house, but has done wonders for my motivation to get the front of the house looking presentable and cute. Until now, I’ve just put it out of my mind. But now, with just a few projects, it actually has the potential to be a very cute little house from the front. So I’ve got to get over this pinched nerve issue, because I’ve got plans, and I’m chomping at the bit to get started on them. Here’s to hoping that a nerve issue can’t keep a good (and very determined) DIYer down for long. 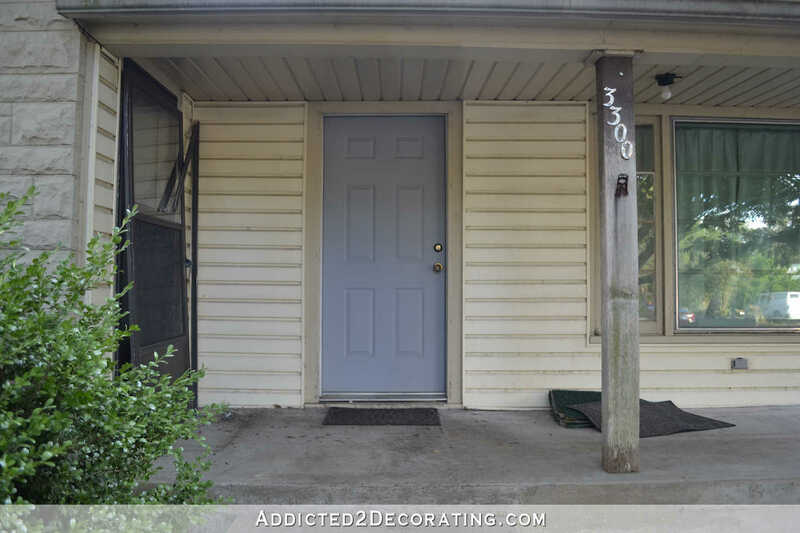 Next Post Garage-To-Studio Conversion & Siding: How Much Has It Cost So Far? Have you ever tried neurosomatic therapy for your pinched nerve? My husband had excruciating pain from a bulging disc in December and January and was considering surgery. This therapy was recommended by a friend with the same issue. The type of therapy treats concentrates on the root problem that is causing the pinched nerve. To say it has been life changing for him is an understatement. He Is now back to 100% and goes in for therapy infrequently for “tune-ups”. I have used this therapy for my TMJ and my back issues from prior surgeries. It’s amazing and very affordable ( at least in Florida). Hope you are feeling better soon!!! Thanks for the suggestion, Beth. I will look into that! Thank you Kristi, for the update! I have always been a strong independent woman. I owned my own house, and did alot of the work myself, as well. Recently, we have been going through some very difficult struggles with our son. I just emailed my sister’s in Christ to let them know they are my Aaron….holding up my arms when I am feeling weary from the battle. Physical, spiritual, emotional…..we need Gods family! We are here if you need us. Praying for your healing Kristi. Carol, sorry to hear you are going through such a hard time with your son – we are as well. Prayers for you and your family….. I missed your posts, but am glad you took the time to let your body begin to heal. I deal with chronic pain, arthritis, back, hip, knee and other physical issues and yes, it does limit your physical ability. Get help when you can…I know you love to do things on your own, but if you can direct and let younger, more able folks do the labor, you’ll then at least be able to enjoy the fruits without suffering. You’ve worked very hard…and hard work causes damage sometimes. Those of us who follow your progress are just glad you are otherwise okay (And Matt also). The porch does look bigger with that space. I wonder how hard it would be to clean up that rafter space and stain it…or if that would look good (most construction grade is pine, which we know stains awful!). I hope you have a restful and recouperative weekend! I’m so sorry you’ve suffered a relapse. Take your time, don’t rush it and be on the lookout for sudden tears appearing out of nowhere. I’ve noticed that the tears can be a side effect for ongoing pain. What a great improvement to the front porch. The exterior has come such a long way in a fairly short period of time. Congratulations! Sorry to hear about your pain! I’ve had a pinched nerve, but it never lasted more than a few seconds. I can’t even imagine how bad it would be for longer than that. I think the raised ceiling looks amazing! MUCH better. The raised angled ceiling made a world of difference. When the time comes will you paint the ceiling Haint Blue? Is that a thing in Texas like it is here in the South? After several chiropractor visits, pain shots, Vicodin, etc. the only thing that finally helped me was an epidural steroid injection in my neck. Bingo! I got immediate relief. I hope you feel better soon. Thanks for the update and best wishes for relief. Years ago I visited and toured San Antonio. In the heritage district many of the houses had big front porches and the ceilings were all painted sky blue. The theory is that birds and bugs don’t want to live there, in the ceiling, because they perceive it as open and unsafe. 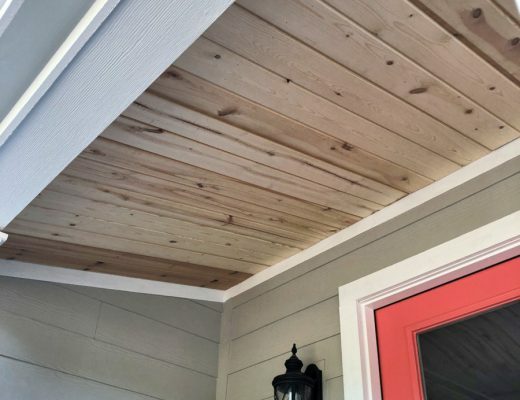 Just saying, when you consider the finish for the ceiling of your porch. I’ve been so anxious to see the front of that house with new siding. Every improvement makes it such a different house. Praying for complete healing with your pinched nerve. And then remember not to use it too quickly after it heals. OOOH, Shingles, you poor thing. I got it when we just moved in to our house in 2007. First, hubby had a heart attack, two weeks after we’d moved in, then just as he was healing from two stents in his heart, I got Shingles. Was out of work for ten days, with his hospitalization, then my intense pain and discomfort. Almost lost my job, but healed enough to go back part time. I had it pretty bad. Stayed on Gabepentin for three years after for the nerve pain. Hope you recover quickly, and remember you are contagious until blisters heal! Hi! I recently had a pinched nerve in my lower back and it shot pain all the way down to my toes! I totally understand what you went through. Have you tried some physical therapy? I just completed about 8 weeks of therapy….it was a godsend. Best wishes to you and I hope it doesn’t return! You are experiencing the “There, but for the grace of God, go I” moment. When we are young (as your are now) it’s so hard to understand why someone is not able to “do” certain things. I hope your issue gets resolved permanently. Removing the flat ceiling is a HUGE improvement, excellent call on your part. Good Morning, sorry your in pain. Just want to share something with you if your source of your not sure of the source of your pain. I had terrible pain shooting pain to my arm and shoulder it would almost make me pass out, after a discussion with my sister she indicated that it might be due to my medication I was taking for high colesterol, after reading the side affects and stopping the meds my pain went away within a few days. Just passing along incase the information may be helpful in your situation. Love your blog! I am so, so sorry you had a relapse. I had the same thing a year ago last spring. Sadly a chiropractor wasn’t enough for me, I started going to a Physical Therapist who also does chiropractic adjustments and its been the best thing ever. To have actual exercises to do, to help strengthen the areas around the my shoulder/back help when I can tell I’m starting to have a “twinge” again. Because after the relapse, I was in FEAR that I’d wake up again with that…you’re right it is SO much pain and to just have it pop up, out of the blue, seriously was scary. So sorry to hear that your pain is back. Hope you are back to 100% really soon! I love the exposed rafters on the front porch, and I love the idea of painting them blue (or a shade that resembles the sky. )Feel better! Dear Kristi…I knew something major had happened because it is not like you to not regularly post. So relieved that it is not something life threatening. Ongoing pain is a real challenge. I pray that there is someone who can help you gain relief. Get well so you can continue what you enjoy. Looking forward to seeing all of the new siding done and painted. Perhaps you can tackle small projects by that time. Complex Regional Pain Syndrome has nearly ruined me, so while I am delighted you understand pain now, I would not wish for you or anyone to experience prolonged agony. I cannot believe mothers have this afflication and are able to cope with young children. I love that you fixed that roof, it was dreadful. You will never regret it. One day my dad and I decided the ceiling on my porch was too low, it felt like it was right on top of our heads so we took it out, exposing the rafters. It looks wonderful. I’m sorry to hear about the pinched nerve recurring. I don’t know if you have coverage for a physiotherapist but I have recently experienced a pinched nerve in my back. You are right, it can be debilitating. In addition, to my chiropractor, I also have a physiotherapist due to some accidents in the past. My physiotherapist worked a miracle, much more so that my chiropractor. He isolated the problem, had me do some exercises that relieved it and sent me home with those. You have an injury and it will probably continue to give you problems. You may want to consider a physiotherapist. In all likelihood, you will be doing exercises & stretches for the injury for the foreseeable future. Although I do hate being stuck in a daily routine, getting rid of the pain seems a good trade off. Good luck with it. I will be reading to see how you are doing. Continuing to love reading about the house. You are my FAVORITE blog. I live in Ontario, Canada and continue to direct people to your blog on a regular basis. I’ve been dealing with nerve pain for the past 3 years, but mine starts in my low back and shoots down my legs. I tried everything: pain relievers, chiropractor, physical therapy and then finally went to a pain doctor. I now get cortisone shots in my back. The pain goes away for several months, or sometimes over a year, and then you have to go again. My husband had the same thing shooting down one side of his legs. He did what you’ve had, then finally they recommended surgery. He was in the hospital one day, had a one inch incision, and after recovery ( not much strain to the back for 6 mos. ) he is fully functioning again with no pain. Don’t know if it works for everyone, but it was great for him. I wish you no more pain! So sorry to hear of your issues, I too have suffered the same. I’ve had two spinal surgeries and it was a Godsend! So, I would recommend, exactly what you have been doing, rehab first. Additionally, my chiropractor does “healing ultrasound” which works wonders. Also, I get monthly acupuncture which unfortunately isn’t covered by insurance but worth it. AND, if all else fails, choose a neurosurgeon to do the surgery, as opposed to an orthopedic surgeon-this was passed along to me from a doctor I knew that had the same surgery as me. Happy healing-the house is shaping up for sure-with or with out you!!! I’m am sorry to hear your pinched nerve relapsed. It’s no joke and it will wear you out. I had the same neck/ pinch nerve into my left arm issue. The non-stop pain is mentally challenging, exponentially so when you tack on little to zero sleep. I wouldn’t wish that on anyone. I haven’t had a flair up in over a year (knock on wood) but when it happens- life nearly stops and then commences again at a very slow speed. The first time it got so bad it was late at night on a weekend, my poor husband was so worried and felt helpless and insisted I go to the ER. I felt like a junkie seeking pain pills at the ER. I don’t even like to take OTC pain pills and it scared the heck out of me when the RX didn’t even TOUCH THE PAIN!!! Weird thing is the first time it happened I had a full time job. It sidelined me for a week from my job, because the chiropractor appointments and treatment was pretty intense, but the tingle and pain was very slow to go away and I have no idea how I had a normal job when that happened, but I did. I swear it’s gotten worse each time. It’s forced me to be more aware of the ergonomics and my posture no matter what I’m doing. I have changed my pillow regularly and a few other ergonomic things and do some neck stretches and that seems to help keep it at bay. Please take care of yourself and don’t be so quick to ditch any stretches or exercising as soon as you feel better (I speak from experience). I wish you well. Take it slow. Please. 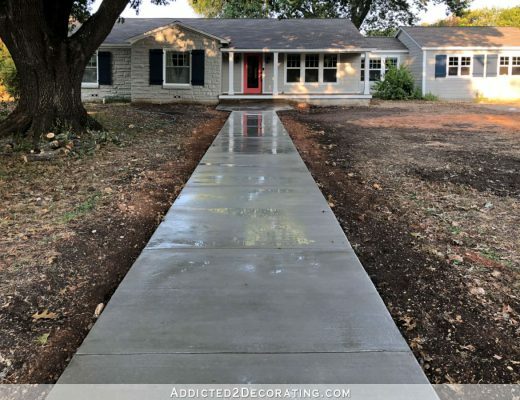 Your home progress is great! The research suggests physical therapy and / or yoga is just as effective and you need to be at a trim / healthy weight. I had a similar painful back issue and now do yoga and or weights 7 mornings a week for 10 years now and it has never returned. I never want that kind of pain again. I agree with your statement about people living with chronic pain. I was ready to drive a car of a cliff the pain was so bad. Sorry to hear you had a setback. I knew something was wrong, and was worried about you and your families! I pray you get relief and figure out what you can do to rectify it. anyway, just want to let you know that I’m relieved nothing life-threatening has happened to you or Matt – which is apparently something a lot of us fear when we’re not hearing from you 🙂 – and wish you a speedy recovery and the patience to sit it out!! btw, the porch is looking way better now, fantastic decision!! Hi Kristi, Do you have a fav youtube video that you have used to paint your cabinets? Ive read every blog, LOVE your work. Ive also seen a lot of cabinets that look like they’ve been painted by want a be DIYer. I need to redo mine. I am such a visual, I need to watch the process from beginning (what paint, products, tools, ETC) from beginning to end. I need my few attempts a time things I’m never happy with the end result. Then I i’ll rate eat your blog and realize I should of done this or that etc. Once I open something and Ive put time and money in supplies I don’t have that desire to do a redo. So with that said, I’m hoping I can educate myself through youtube. I feel you have a go to one you’ve used or even better if you have one please share. YOur awesome, I know this is off subject to your post, I hope that is okay. Much better now. New siding is much more attractive (I HATE vinyl, even though I have it, cause it’s cheap) Anyway, new new porch roof is much better. I never realized how low it was. But I still mourn for the stone you removed from the side. I thought the stone was cute. Hopefully you can re-use it. I was worried about you yesterday! We hadn’t heard from you & i was hoping everything was ok! Take it easy and don’t push it!! Have a great weekend! If you havent gotten one already please get an MRI, your symptoms sound eerily like my husbands :(. I can imagine how much better you feel after that porch change. Just seeing the before and after pics even I could feel the lift of spirit :). I just spent 3 excruciatingly painful months in a wheelchair. I had a double whammy of sciatica in addition to bursitis in my hip, both on the right. I hurt all the way from my waist down to my foot. My neighbor recommended her expert acupuncturist. I had four sessions and got two homeopathic injections during the last one. A day later, I was able to walk again. The last person I’d go to for a pinched nerve would be a chiropractor. The homeopathic injections are German and approved by the FDA (and also my PCP). They were for pain and inflammation. She said the acupuncture alone would have worked but would have taken longer by itself. More and more physicians are recommending (and studying) acupuncture. I hope you’re feeling 100% better soon. Check out Grand Designs on Netflix, maybe you’ll get more ideas for the exterior! It will definitely keep you distracted. So sorry to hear your pain has returned- hope you get to feeling better soon! Must admit that I was surprised to see you reference Bas Rutten on here. I am very familiar with his story and listen to quite a bit of his podcasts. Out of of curiosity, how did you come across his story? PLEASE GET THAT MRI!! There is no such thing as “just a pinched nerve” unless you want to risk permanent damage. Not trying to scare you, but you need to be aware. I am also a neuro ICU nurse who had a herniated disc (C6-7) and had to have a disc replacement in 2015 after years of lifting patients. PLEASE get yourself checked out by a neurosurgeon!! I understand the desire to treat your symptoms conservatively/homeopathically/inexpensively, but you can always decide whether to use surgical vs. non-surgical (chiropractic, etc) methods once you know EXACTLY what you’re dealing with. I will be happy to explain more privately, if you wish, but PLEASE get it checked out. Kristi, have you actually been diagnosed with a pinched nerve? I’m asking because your symptoms (as you’ve described on previous posts) sound an awful lot like mine, and I have Thoracic Outlet Syndrome. It flares up when I do a lot of repetitive motions with my arms and even my fingers. The pain is worse at night for some reason. Google it. Can’t say I’ve had much luck treating it or relieving it, but it sometimes helps just having a proper diagnosis.